Relive live text commentary of Arsenal's 1-0 win over Qarabag in their final Europa League group stage fixture. That's all we've got time for tonight. Stay tuned for our report in the coming minutes and stick with us over the weekend as we'll have plenty of Premier League coverage coming your way. I've been Matt Dawson, thanks very much for joining me. Qarabag didn't offer very much over the course of the 90 minutes. They scored just twice in the Europa League group stages this season and had a disappointing European journey. Also encouraging for Arsenal was Laurent Koscielny's return to the side. He may well be needed against Southampton at the weekend with suspensions for Mustafi and Sokratis and Holding's injury so this was an encouraging outing for the Frenchman. It's a fifth clean sheet in a row for Arsenal in the Europa League who have coasted through the group stages without really hitting top gear. Emery has brought through some young blood in the last two matches and they've really impressed. Nketiah showed a lot of promise with some intelligent runs in attack and unfortunately had a goal disallowed. 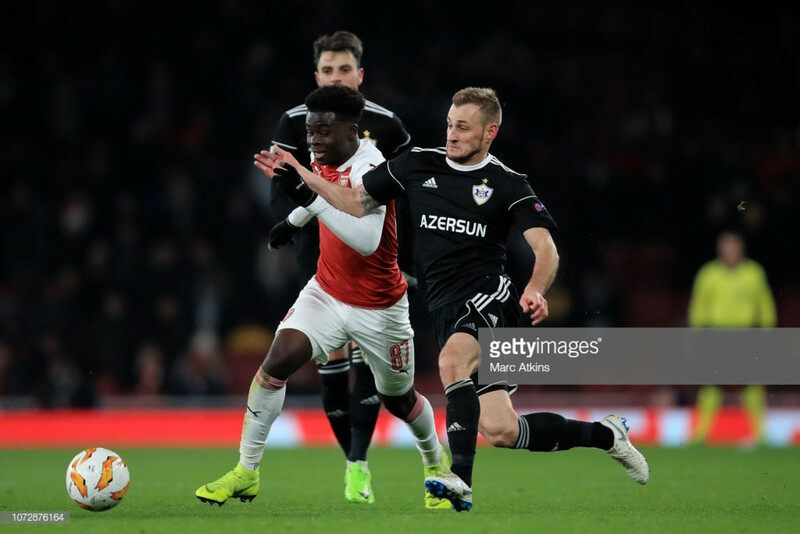 But the main talking point will be that of Bukayo Saka who was terrific out on the left flank. Job done for the Gunners. Not a spectacular game by any means but Arsenal take the three points from their final group game courtesy of Alexandre Lacazette's first-half strike. 92' Into added time now at the Emirates. Nketiah receives the ball on the edge of the box and shows a good touch to burst into the area but across comes the defender to cover and prevent a shot at goal. We've got four added minutes in total here. 89' An unbelievably good chance for Saka who should have made it 2-0. Nketiah slides the ball across to the 17-year-old who has plenty of space but Vagner makes a top save. Had he scored that he would have become Arsenal's youngest goalscorer in European competitions. 87' An ironic cheer for Arsenal goalkeeper Emi Martinez as he takes the ball into his arms for quite possibly the first time tonight. I can't remember him having to make a save at all. 85' Rzezniczak is off and on comes Ozobic. An attacking change for the visitors. 83' Mesut Ozil who provided the assist for Arsenal's goal, is off. On comes the young Charlie Gilmour. He also played against Vorskla in the Gunners last Europa League outing. 80' Saka is momentarily down on the turf after receiving a knee in the back from Medvedev. He's able to carry on though. 76' Arsenal have the ball in the net again but it's been ruled out for offside. Saka put a lovely ball in from the left and Nketiah glanced it home but he was adjudged to have been beyond the last defender. 74' Another change for Qarabag as Madatov is off, and on comes Spaniard Dani Quintana. He scored a hat-trick at the weekend. 72' A second change for the Gunners as Koscielny's night is done. He is replaced by Nacho Monreal who could also do with some minutes under his belt. 69' Saka is again involved as he turns in the middle of the pitch and then drives towards the box before hitting a shot straight at the goalkeeper. 65' A great chance for Saka after terrific work from Maitland-Niles who pulls it back to him. The winger's effort is blocked from close range, however, and goes out for a corner. 62' Zech Medley is on for Alexandre Lacazette. It's a second first-team appearance for the tall defender after coming on against Vorskla too. He's gone to left back which means Maitland-Niles has moved to the right of midfield. Nketiah is now up front. 61' A first change for the visitors. Michel is withdrawn and on comes Abdullayev. The player to come on then almost makes an instant impact as he gets on the end of a cut back from Zoubir but Abdullayev fails to make meaningful contact with the ball. 57' A rare chance for Qarabag as Guerrier meets a header from a corner but puts it off target. Emi Martinez had come out to claim it but missed the ball completely. 55' An interesting free-kick from Ozil who floats the ball into the box, rather than driving it but Sokratis can't get over the header and it goes harmlessly wide. 50' Carl Jenkinson gets forward from right-back and sees a cross blocked with plenty of Arsenal bodies queuing up inside the area. Jenkinson then gets another bite of the cherry as he lines up a shot but it's blocked once more. 46' Ainsley Maitland-Niles shows good positivity at the start of the second half as he gets forward and drifts inside from left back before hitting a shot high and wide of the target. 46' Back underway in the second half. No changes for either side. The Gunners have been relatively untested at the back. Emi Martinez on his first Arsenal appearance for 20 months has barely touched the ball whilst it's been a comfortable night for the returning Laurent Koscielny who hasn't had to be involved in too many duals. A far from lively first half but it was extremely comfortable for Arsenal who lead at the break courtesy of a fine finish from Lacazette. The Gunners go into the break one goal to the good. 37' Ozil plays a corner into the box from the right-hand side and it picks out Nketiah but he heads over. The latter had done well to win the set play initially, beating his man before having a cross blocked. 30' Unsurprisingly this game feels a little like a pre-season encounter. Not much intensity or tempo to the match so far despite the goal. 24' Another player who has looked really positive in the opening quarter of the game is Nketiah. He's made some intelligent runs down the channel and is showing promise on the right-hand side. 20' Mesut Ozil has had a really bright opening 20 minutes on his return which will encourage Unai Emery ahead of the weekend. 19' Really good defending from Sokratis who gets across to deny Medvedev from getting a shot away. The defender had somehow got in behind the Arsenal defence but Sokratis recovered well. 17' Arsenal are up and running for the night! Nketiah does well to win the ball back and then Ozil picks it up. He has the freedom to find Lacazette in the box who gets the ball out of his feet and then buries the opportunity brilliantly from a slight angle. It was a lovely finish and that's his eighth of the season. 9' The first sighter of goal on the night for Arsenal. Bukayo Saka cuts inside and hits a left-footed effort which is deflected and then pushed straight into the path of Willock by the goalkeeper Vagner. However, the midfielder can't get his feet sorted out and it bounces wide. 2' Barely any atmosphere inside the stadium tonight, such is the low attendance. You sense it might be a difficult one for the Arsenal players to get going in. 1' We're up and running. The players are out on the pitch and we're moments away from kick-off. It's a very empty looking Emirates Stadium tonight which is hardly a surprise given Arsenal's position in the group and the side the Gunners have opted for. Chelsea have already played tonight and drew 2-2 with Hungarian side FC Vidi. The Blues were already through so that result doesn't mean too much. Rangers needed a win against Rapid Vienna to progress through their group but suffered a 1-0 defeat and therefore finish third in their group. Just under ten minutes until kick-off at the Emirates. Arsenal are hoping to cap off an unbeaten group stage. No Halldorsson in goal for Qarabag then as they go with Brazilian Vagner who also started in goal the last time the two teams played each other. Michel starts in midfield whilst top scorer Medatov is in the line-up. Zoubir will be another player to look out for as he starts in attack for Qarabag. He caused a few problems in Azerbaijan in their last meeting. Vagner, Medvedev, Rzezniczak, Sadiqov, Huseynov, Guerrier, Slavchev, Qarayev, Michel, Madatov, Zoubir. Subs: Mammadov, Abdullayev, Quintana, Mahammadaliyev, Ozobic, Agolli, Diniyev. An interesting mix of youth and experience for Arsenal tonight. Laurent Koscielny returns to first team action for the first time since May as he starts alongside Sokratis. The latter is suspended for Sunday's trip to St Mary's so starts tonight. Ozil is also back in the side, whilst there's probably rather surprisingly a place given to Alexandre Lacazette. Carl Jenkinson and Maitland-Niles start as the full-backs and Eddie Nketiah and exciting 17-year-old Bukayo Saka are on the flanks. Martinez, Jenkinson, Sokratis, Koscielny, Maitland-Niles, Elneny, Willock, Saka, Ozil, Lacazette, Nketiah. We have team news a little earlier than expected. We'll have confirmed starting XIs around an hour before kick-off so join us for that and plenty more build up before things get underway at 8pm on Thursday evening. Following abuse hurled the way of Raheem Sterling during Manchester City's defeat to Chelsea last weekend, there has been a lot of coverage regarding racism and the treatment of black footballers. After Sterling commented about the issue on social media, Maitland-Niles also spoke about it during Arsenal's pre-match press conference on Wednesday afternoon. The young midfielder said: "I have [experienced it]. Not at a professional level but growing up in the youth ranks. I think it's disgusting, honestly," he remarked. "I really do credit Raheem for coming out and standing up for himself and other players and speaking about it. But, I just think that if a lot of football clubs and some of the players too can join forces to really put our heads to it and try to kick it out, it would be the best thing possible," Maitland-Niles added. Arsenal have only met Qarabag once and that came earlier in this season's Europa League. The Gunners were comfortable victors in Azerbaijan as they won 3-0 thanks to goals from Sokratis, Smith Rowe and Matteo Guendouzi. Qarabag have never beaten Premier League opposition and their only goal has come from the penalty spot in a 3-1 defeat against Spurs. Emery has prior history in this competition, having won it three times in a row with Sevilla. Arsenal fans will be hoping he can replicate prior successes this season and they've already cleared the first hurdle by qualifying for the knock-out stages. "Our first aim in this competition, we have done, which was to be first in the group," Emery commented. "But we respect this competition and we respect Qarabag and tomorrow our objective is to win and we are going to give players chances tomorrow to take responsibility, take rhythm and take confidence," the Spaniard continued. They will be without key striker Vincent Emeghara. The Swiss forward isn't set to play again until 2019. That means that Qarabag will likely start with Araz Abdullayev. He's started three matches already in Europe this term but only has the one goal all season. Their main source of goals has come from Mahir Medatov who has seven strikes to his name. Icelandic international Hannes Halldorsson may start in goal whilst one of their main creative outlets will be former Birmingham midfielder Michel. Laurent Koscielny is set to play for the first team for the first time since May after his Achilles injury which he sustained against Atletico Madrid in this same competition. The match may also be used to bring Mesut Ozil back up to speed who has missed the last couple of weeks of action through a back spasm. 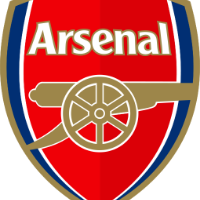 Arsenal to rely on youngsters? Emery handed three first-team debuts out against Vorskla on matchday five with Zech Medley, Charlie Gilmour and Bukayo Saka all appearing from the substitutes bench. They could all appear again with nothing riding on the match. Eddie Nketiah, whose hold up play was impressive in Ukraine a fortnight ago is expected to play, as too Joe Willock who scored in that fixture. Ainsley Maitland-Niles is expected to play but Emile Smith Rowe who has starred in Europe this season hasn't been seen in any training photos since the start of December which could mean he's suffering from a slight injury. Qarabag arrive in London second in the Azerbaijan Premier League and have scored an incredible 11 goals in the last two matches. They may look a side with goals in them but that hasn't been the case in Europe as they've only scored twice in five outings. Qarabag were on the end of an absolute hammering against Sporting on matchday five as they were defeated 6-1. Their sole priority will, therefore, be to claim another league title. Currently, they sit behind Nefti who are three points clear in Azerbaijan. Arsenal are currently on a remarkable 21 match unbeaten streak under Unai Emery. They came through tough tests against Spurs and Manchester United in recent games before scoring late on to secure victory in a tight affair against Huddersfield last weekend. Lucas Torreira was pivotal in each of those games, as he scored his first goals for the club in the north London derby and against the Terriers. It's likely he'll receive a rest on Thursday night, though. Qarabag don't have too much European pedigree but having played in the Champions League previously would have expected to put up a slightly better fight than they have in this season's Europa League. The side from Azerbaijan are bottom of the group with a goal difference of minus ten and with a trip to the Emirates on matchday six aren't likely to better that. For the Gunners, this Europa League lark has all seemed rather easy. They've kept four clean sheets in five games and have only dropped points once. Arsenal have coasted to top spot in the group and will, therefore, see this match as a chance to see what the fringe and youth players can do. There aren't many meaningless matches in a season but this one has nothing riding on it at all. Hello and welcome to VAVEL UK's live text commentary of Arsenal vs Qarabag in the Europa League. I'm Matt Dawson and I'll be taking you through all of the build-up and then the match action as things get underway from 8pm GMT.